My decoding isn’t complete, by any means, but given the complete lack of any other examples out there, I thought this would probably be helpful, even in it’s current state. You’ll need to install WSGD as per the instructions at that site, and then you’ll need this zip…. I tried as per the steps to decode mqtt messages but unable to do it.I was trying the sample applications and followed up the instructions given here to decode mqtt message.I am getting no mqttv1.3 messages in my wireshark 1.6.2. What could have gone wrong. I kept all the three files (mqtt3.1.wsgd, mqtt3.1.fdesc, and generic.dll) in the plugins/1.6.2 folder and started wireshark. but could not get any mqtt messages. As reference to my previous posting, I am properly getting MQMT message.Sorry there was mistake in my part. For anyone scratching their heads after using this dissector, there is an error in the length of the payload of PUBLISH messages in mqtt3.1.fdesc (line 110). Still, extremely useful work, thanks a lot! 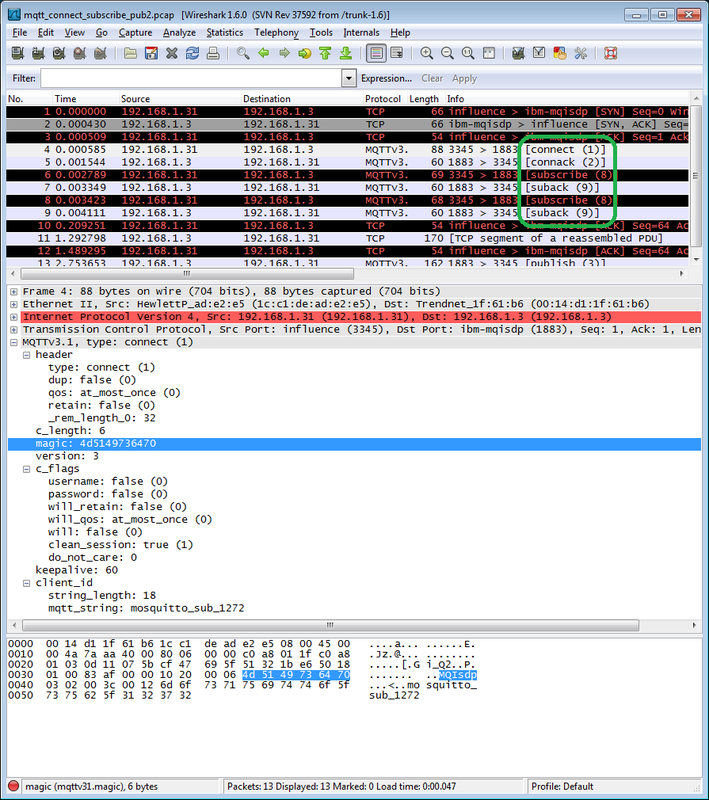 Do you have a sample capture file of the traffic you decoded using this? Not that I have kept lying around, no. It’s kind easy to capture your own though, why do you need a particular sample from me? Thank you for this…. as you say very little other examples online of this stuff. My company uses a simple, custom protocol built in-house and I needed to build a descriptor. Eventually I was able to do it, in no small thanks to your post.